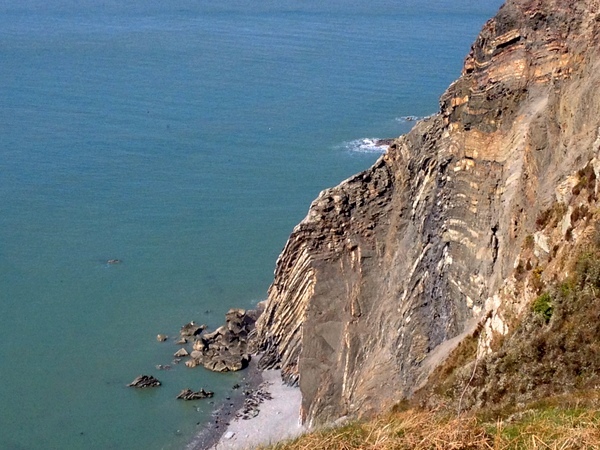 On a warm and sunny mid-April day, we took a picnic and went for a short walk round Cemaes Head in North Pembrokeshire. We were rewarded with superb views of Poppit Sands, the Teifi Estuary and Cardigan Island but best of all were the fabulous sightings of Atlantic Grey Seals. 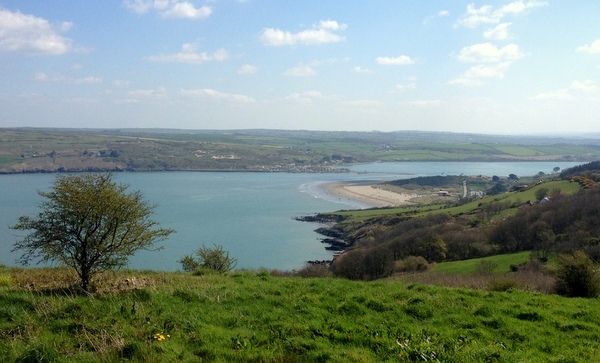 Looking back as we started out, we saw Poppit Sands and the Teifi Estuary with the tide in. The estuary widened out into Cardigan Bay and across the blue of the water, we had a beautiful view of Cardigan Island with the houses in Gwbert visible on the clifftops opposite and the mound at Mwnt beyond. 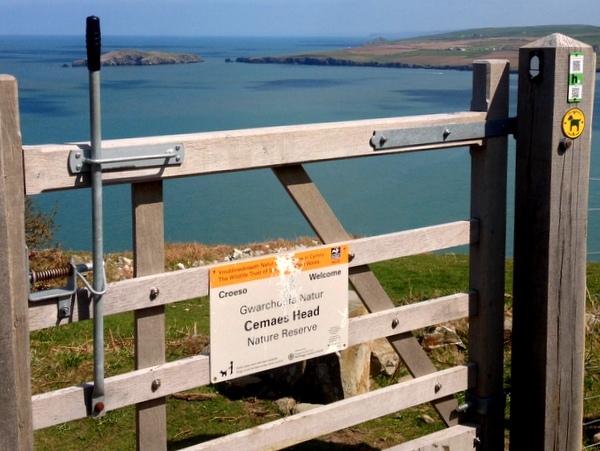 We went through the gate to the Cemaes Head Nature Reserve. The reserve is managed by The Wildlife Trust of South and West Wales to preserve the habitat for feeding chough and nesting skylarks. It appears to be working: we heard skylarks singing as we walked. We stopped for our lunch on the grassy clifftop. With one hand for our picnic and the other for our binoculars, we watched for seals in the sea below us. At one time, we saw 9 in the water as well as a young one hauling itself up to bask on a large flat rock. This friendly little chap came over to say hello. 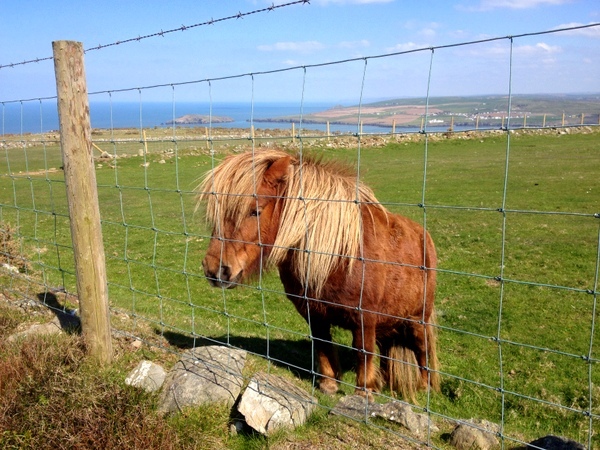 He’s doing great work in the Cemaes Head Nature Reserve: grazing ponies help control bracken and keep the sward short, encouraging feeding Chough – who also find the pony dung a bit of a treat! … they were seals. Lots of them! We counted at least 50 basking on the shore and in the shallows. The largest and darkest are the bull seals while the cows are grey and the youngsters are still quite pale. It was an amazing sight – and sound: we could hear their calls as they bounced off the steep rocky cliff face. We stood transfixed for some time, watching the antics of the seals below us before setting off on the path again. We covered only a short distance on this walk but we spent hours in the sunshine watching seals and birds, taking photos and gazing at the cloud shadows on the blue sea. A perfect day, and the seals made it one to remember. The Cemaes Head walk is usually a circular one of 5 miles (about 3 hours) or more, starting from the Poppit Sands car park or St Dogmaels but this time we found a new starting point which made it an easy 2.5 mile circuit. Starting point: Allt y Coed Farm Campsite – follow the road past Poppit Sands car park as far as it will go. Go through the gate at the end in to Allt y Coed Farm where parking costs £1.50. The route: follow the Pembrokeshire Coastal Path signs (an acorn symbol) through the farmyard (we saw goats, sheep and more). 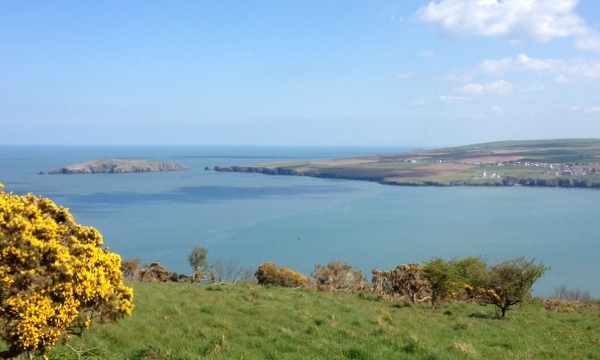 Look back for excellent views of Poppit Sands and the Teifi, look across the estuary to see Cardigan Island and spot the distinctive peak of Mwnt. As you round the headland, keep a sharp eye out in the sea below for seals but take great care not to go near the edge in case you are treading on a crumbling overhang. Look back to try and spot seals on their favourite pebble beach (binoculars at the ready). Then the path rounds the cliff above another small cove where in autumn we have seen seal pups. After that you climb a set of fairly steep steps and then follow the footpath signs to turn inland instead of continuing on the coast path. When you reach a junction in the path, go through the wooden gate on the left, down a grassy path between stone walls to take you back to the road. Turn left to walk back along the road to Allt y Coed Farm. 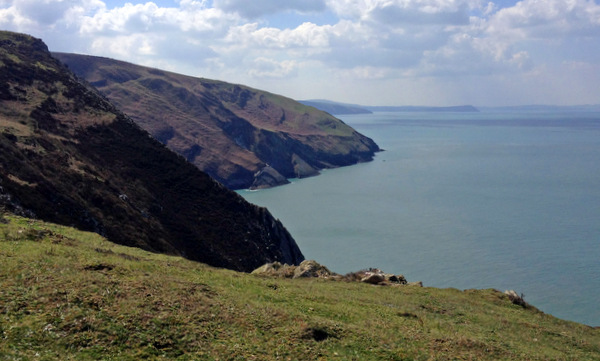 This walk is within easy reach if you are staying in a holiday cottage in North Pembrokeshire or South Ceredigion. To see our nearest, check our pages for holiday cottages in St Dogmaels. This entry was posted in West Wales walks. Bookmark the permalink.